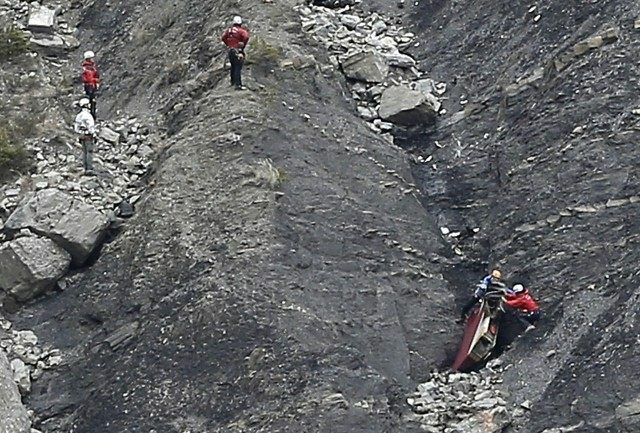 CNN reports French authorities are disputing a report, published in Paris Match and the German newspaper Bild, claiming that cell phone video taken during the final moments of Germanwings Flight 9525 has been found. The French and German sources did not publish the video itself, but their descriptions of it line up with information released to the public about the audio recording from the plane’s cockpit. Of course, since that information is both vague and widely known, concocting a matching video clip would not be difficult. Taken on a cell phone, the video “was so chaotic that it was hard to identify people, but the sounds of the screaming passengers made it perfectly clear that they were aware of what was about to happen to them,” according to the French magazine Paris Match, which obtained the video along with the German newspaper Bild. “One can hear cries of ‘My God’ in several languages. Metallic banging can also be heard more than three times, perhaps of the pilot trying to open the cockpit door with a heavy object. Towards the end, after a heavy shake, stronger than the others, the screaming intensifies. Then nothing,” Paris Match reports. It seems incredible that cell phone memory could have survived the crash intact. Upon first hearing of the story, I thought the video might have been uploaded into cloud storage somehow. However, the French police did say they have collected reasonably intact cell phone materials from the crash site, implying that they have not been able to extract any useful data from them yet. The denial actually makes it sound like they have not tried, although that is hard to believe, given what a significant source of information cell phone data might be, and the high probability that someone from among the 149 passengers and crew would have tried using their phones during the final minutes of the flight. Bild emphatically insists that “the authenticity of the video is unquestionable.” The German paper says the clip was shot from the rear of the plane, although it was unclear if a passenger or crew member was using the phone. (Wouldn’t it be possible to determine whose phone it was, if the system was intact enough to produce usable visual and audio recordings?) The article even claims the video captured the moment of impact, when part of the aircraft made contact with a mountain in the Alps. Bild also took the trouble of consulting a cell phone technician, who testified that while smartphones were unlikely to survive such a crash intact, it was possible that the phone’s tiny memory chip could survive, protected by the rest of the device. Paris Match included a detailed timeline of the cockpit flight recording, ostensibly provided by a special investigator working the case. The French magazine also insists the cell phone video is authentic, and matches the events described in this timeline.